Have you ever looked to sell grain today, but the price doesn’t quite meet your objective? Rather than just waiting to see if the market will move higher, ADM offers a Price Max contract to help you add value to your grain sale today. Price Max is a grain marketing tool that allows you to earn a premium on approved new or existing contracts, in exchange for a conditional firm offer at a maximum price in the future. ADM products and services vary by location. You decide to do a Price Max on a new or existing contract where the futures reference price is established. You choose the specific Price Max conditional offer price and target offer date, and the corresponding Price Max premium will be added to your contract. On the Price Max conditional offer date, the following formula will determine whether or not your offer is accepted or expires with no obligation. If the Price Max conditional offer is accepted, you can work with your ADM rep to establish basis and delivery per contract terms. Helps achieve specific price targets that may not otherwise be achievable. Can be customized based on your risk threshold and price targets. Automatically executes according to the formula in place. The Price Max contract can be applied to any existing or new contract today where the futures reference price is established, and for bushels to be delivered now or later. Note: The number of bushels on your Price Max conditional offer will be equal to the bushel quantity of your original contract. You keep the Price Max premium on your original bushel quantity no matter what. Once these components are defined, your Price Max premium will be determined. When added to the market price, or your pre-existing contract price, if the premium meets your pricing objective, you can choose to enter into a Price Max contract. This means adding the agreement to offer the same bushel quantity, at a maximum price, to be delivered in the future — if your Price Max target offer is accepted on the target offer date. On the Price Max target offer date, the futures reference market associated with the conditional firm offer price settles above the Price Max target offer price. If accepted, you’ll receive a new contract for the bushel quantity that you committed to the original Price Max contract, at the agreed upon maximum futures reference price. You can work with your ADM representative to set basis per the terms on the contract. 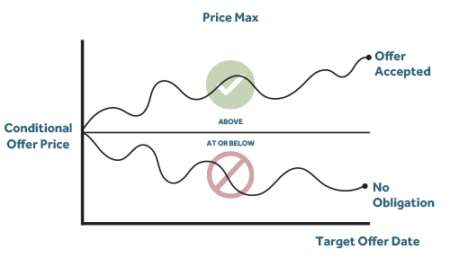 On the Price Max target offer date, the underlying futures reference market associated with the conditional offer price settles at or below the Price Max conditional offer price. Your offer expires and there is no additional bushel commitment. When entering into a Price Max contract, it is important to evaluate the percentage of your crop that the Price Max conditional offer represents, and to have comfort with the Price Max conditional offer maximum price commitment. Remember, you will not know if your conditional offer price will be accepted or not until the target offer date.